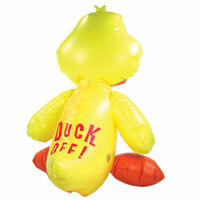 Duck Off. 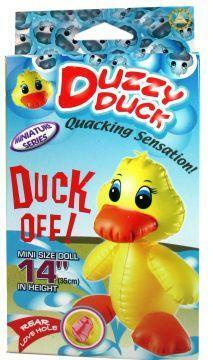 Duzzy Duck Love Doll. Adult pool parties. 14 inches tall. One hole in rear. Great party decoration. Adult novelty. Inflatable. Not a life saving device. Phthalate free, non-toxic materials: Plastic. Golden Triangle Novelties Catalog. GT Adult Toys for Everyone.